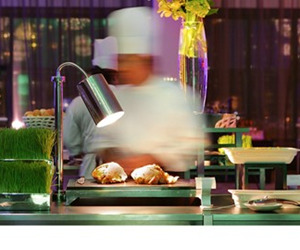 Industry reports show Food & Beverage is the third highest expenditure in hospitality business. In the case of a full refurbishment, new buffet equipment sets to cost you more than $87,000 (USD) and table equipment around $16,000 (USD)* HVS Designs – Hotel Cost Estimating Guide. So, the equipment you use to cater, wine and dine, should not be an ongoing outlay. It should work for you as a solid investment, delivering high performance, maximising operations and extending to deliver new and creative experiences, when you want it to. Equipment that adapts to your space offers added smarts and speed to your operations. So, think modular, think transformable, think reversible minus the assembly. Maximise your offerings with solutions that offer you more with less, saving setup time, staff resources and offering faster conversion to new experiences. Source hospitality equipment that offers interchangeable smarts, mobile operations and flexible power. Get smarter with your choices. Yes, your CAPEX matters. Equally, so do the experiences you deliver. Your brand should be the main objective with everything you do! Your décor. Your offerings. Your customer service. Your uniform. Your brand defines your reputation and the future of your business. So why look at your equipment any differently? Utilising equipment that offers clever solutions, allows you to deliver clever experiences, maximise your brand, and, of course your ROI. Because it pays to be clever... with quality design. Seek products that are timeless in their design and durable to withstand long-term use. Our opinion, is to never compromise on quality. Clever designs do not include planned design obsolescence, and long-term, this contributes to sustainable practices by reducing your repurchasing cycles. Quality design offers long-term linen-free presentation options. And as you know, this will save you significant expense, not to mention the expense the use of linen has on the environment. Imagine equipment that can deliver as much value across your F&B offerings, as it does upon initial purchase. Now, imagine products that provide multiple solutions, products that can be used across your establishment, and set your experience apart from the rest.